Led by CRC Volunteer Coordinator, Danielle Stehlik . Please RSVP at dms@thecharles.org so there will be enough tools and gloves for all participants! Meet at the powder magazine. This Cambridge Discovery Day tour will be led by scholars Marilyn Wellons and Nina Cohen. Questions? Contact Nina at ninascohen@yahoo.com. Tour Description: Over the centuries, Magazine Beach has had many incarnations. Surrounded by salt marshes and oyster beds, it became a military lookout in the 1600s and 1700s; a secure and isolated location for the storage of gun powder in the 1800s; and a popular bathing area in the 1900s–that is, until it was closed due to concerns about polio and pollution in 1947. Learn about mercenary Captain Daniel Patrick who was granted the island in 1636, and about surveyor Peter Tufts, Jr. who with his son served as keepers for the 1818 powder magazine. It was the Olmsted Brothers (of Emerald Necklace fame), themselves, who turned this fifteen-acre parcel into an urban park in the late 1890s as the people of Cambridge longed for a water park and playgrounds for the young. This tour will be repeated on Saturday, August 11th, 10:30-11:30am. For information about other Cambridge Discovery Day tours, go to: www.cambridgema.gov/historic/walks.html. 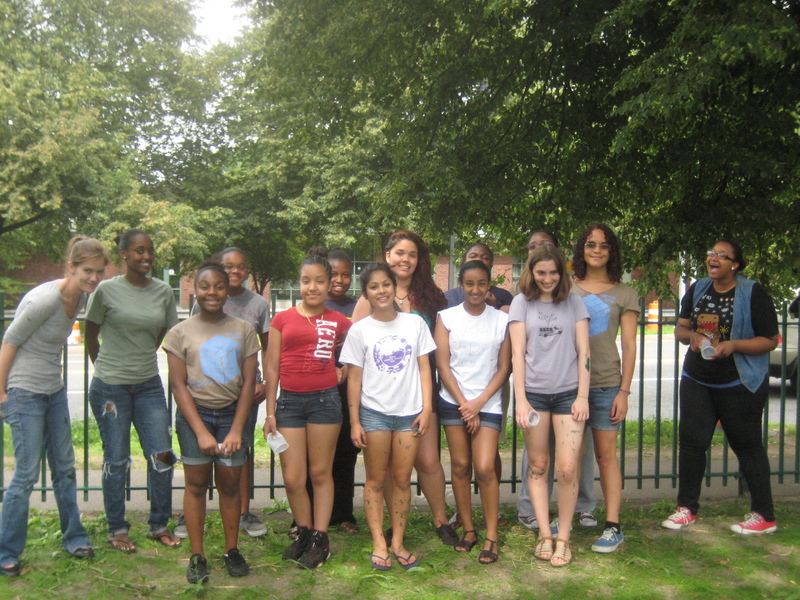 Below: July 5th the Creative Action Project girls painted the railings under the new pedestrian footbridge and picked up trash. Thank you CAP girls and to Danielle Stehlik, too, for organizing the event and taking the photos.